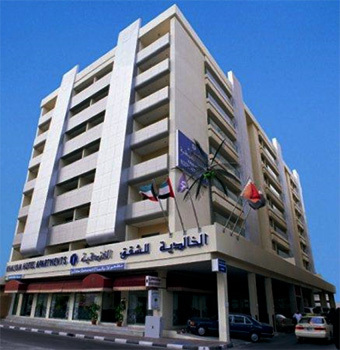 Centrally located in the heart of Deira on the city’s fashionable Al Maktoum Road, the Khalidia is an apart-hotel offering a range of neatly furnished, fully-serviced apartments. The Khalidia Hotel Apartments offers a total of 42 one, 2 and 3-bedroomed units, all of which are fully furnished and include a range of modern amenities. Each apartment features guest bedrooms with en-suite bathrooms, a separate living area with sofas, dining table, DVD player and more plus a fully equipped kitchen with full cooking utensils. Guests at the Khalidia can make the most of the 2 on-site restaurants. The fantastic Mediterranean restaurant offers lavish buffets, theme nights and freshly-baked pizzas. Or try traditional Lebanese cuisine at the hotel’s Arabian restaurant, complete with live music and shisha. The Khalidia Hotel Apartments is located within walking distance of the famous Dubai Creek and the bustling Al Rigga Street. Deira City Centre Shopping Mall is also within easy reach.